Your essential Canon EOS 77D camera field guide in a convenient pocketable style. This EOS Pocketbook for the 77D is a concise guide to your camera and small enough to carry with you everywhere. Nina Bailey, Technical Editor of EOS magazine and author of the popular EOS eBook series, has the solution. 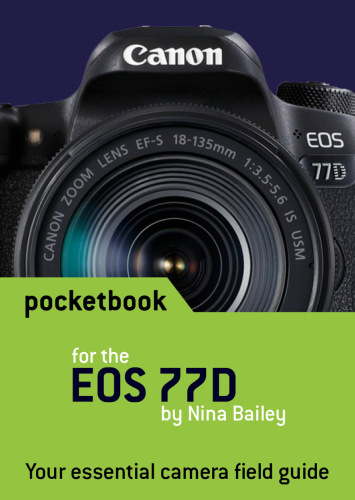 This new Pocketbook for the Canon EOS 77D is a concise guide to the most used and confused features and controls on your camera, based on Nina’s vast experience as lecturer at EOS Training Academy – hearing first-hand what photographers want to know and understand about how their EOS 77D camera operates. Have not received order as yet so hopefully not far away. Thank you for your review. The order was despatched to you on the 17th December, unfortunately, delivery to New Zealand can take up to 14 working days and with the Christmas backlog it can get held up in the postal system. I hope it arrives to you shortly. Great little book to help you when you are out with your camera until you get fully used to it. An easy online purchase and quick delivery experience. The booklet is concise and well illustrated giving a good background to what the camera can do. There’s plenty of information that’s not readily available elsewhere and with its compact size and a useful little plastic wallet to keep it in this is money well spent on a useful pocketbook. As expected, good informative guide. Hmmm was ok - thought it might have had a bit more to it for the price.